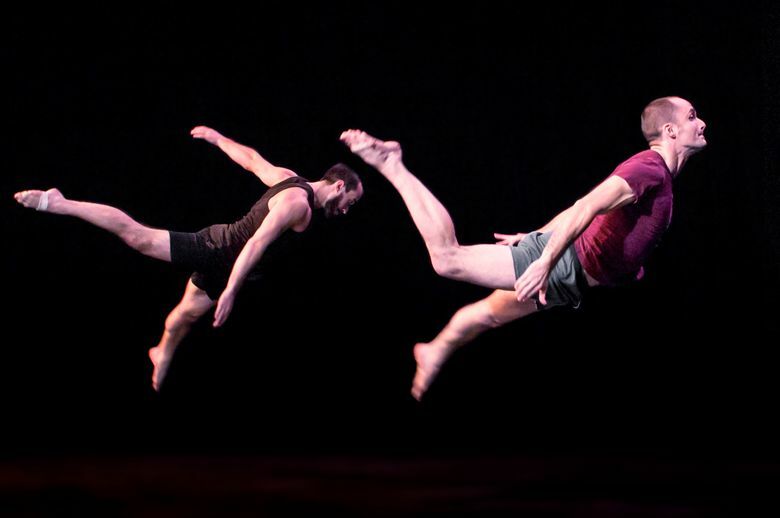 “Love & Gravity” is a feast of acrobatics, juggling, mime, contortionism and dance, writes reviewer Michael Upchurch. They call themselves Acrobatic Conundrum – but the only real conundrum they present is the question of how they do what they do. How do you launch into a somersault from standing position and land on your feet in perfect time with your partner? How do you plummet 15 feet down the silks into a catch-knot without breaking yourself in half? How do you pull your fallen trousers up while rocking a giant metallic hula hoop? Acrobatic Conundrum’s delightful show, “Love & Gravity,” addresses all these issues and more. It’s a feast of acrobatics, juggling, mime, contortionism and dance, served up in a package that examines the pitfalls of romance while defying the dangers of gravity. 8 p.m. Dec. 12, 15, 16 and 17; 5 p.m. Dec. 18; and 2 p.m. Dec. 17. 12th Avenue Arts, 1620 12th Ave., Seattle, $15-$24, pay what you can on Dec. 15 (302-330-7469 or acrobaticconundrum.com). The focus is mostly on the physical derring-do that its seven cast members engage in, sometimes alone, sometimes in tight unison. But there are antic verbal exchanges too. (She: “I actually don’t know if we’ll ever agree on anything.” He: “I agree with that.”) The two-hour show sounds notes both droll and melancholy, as it touches on loneliness and attraction, connection and uncertainty. Artistic director Terry Crane founded the troupe in 2012, and each member brings a special touch to it. Ty Vennewitz, a self-described “towering performer,” looms a foot or two taller than the rest, and uses his height to goofy clowning effect. A duet he performs on the hoops with Crane (who’s tiny) is a comic-poignant meeting of absurdly different physical types. Lauren Joy Herley puts contortionist twists on her exquisite acrobalancing routines. Cooper Stanton seems as comfortable on his hands as on his feet, and the lithe circle of cartwheels he uses to try to escape a rectangular prison of light is a thing of desperate grace. There’s a spectacular duet between Crane and Erica Rubinstein where, at one point, he races up the side of her body and stands perched on her shoulders. Xochitl Sosa endows a trapeze routine with spiraling beauty. Carey Cramer throws a little song in with her fidgety dance and feisty acrobatics. Props are minimal, and scenery nonexistent – unless you count a red circular rope on pulleys that the performers hitch a ride on. The strength of and trust between these artists is phenomenal. The grand finale is a rope-artistry fantasia with six aerialists floating toward the rafters. It’s a perfect closing image to an exhilarating show.